Shop for authentic Nebraska Flags. We offer indoor and outdoor Nebraska flags in durable nylon. Our outdoor flags are finished with a canvas heading, while indoor flags are finished with a lined pole hem and your choice of with or without fringe. We also offer indoor and outdoor Nebraska flag sets. 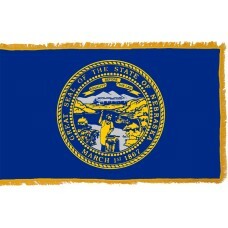 The Nebraska State Flag features a blue field with the Seal of Nebraska in gold in the center of the flag. The seal shows the Missouri River with a steamboat, a blacksmith with a hammer and anvil, a settler's cabin that is surrounded by wheat and corn, and a train heading towards the Rocky Mountains. Above the mountains is the state motto "Equality before the law." The circle around the illustration contains the words "Great Seal of The State of Nebraska March 1st, 1867." The Steamboat on the river represents the commerce of Nebraska, the train represents the transportation, the wheat and corn represent the agriculture, the river and mountains represent the natural wealth, and the blacksmith with the hammer and anvil represents Nebraska's industrial development. 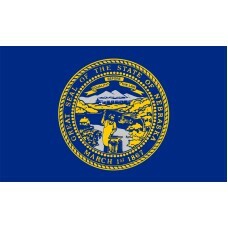 The Nebraska State flag is very symbolic as it represents the states hope of a bright future and its growing wealth. Nebraska was one of the last states to adopt a flag and it was adopted on July 16th, 1963. Nebraska is a state located in the Midwest region of the United States of America. It shares borders with Wyoming, Kansas, Colorado, Iowa, Missouri, and South Dakota. The capital of Nebraska is called Lincoln (was formerly known as Lancaster until it was renamed in honor of President Lincoln) and the large city is called Omaha. Nebraska is referred to as "The Cornhusker State" in reference to its agriculture. It was named this in 1945 as it used to be referred to as "The Tree Planters State" due to the millions of trees that were planted by the early Nebraska settlers. Nebraska was inhabited by Native American Tribes that included the Omaha, Pawnee, Missouria, Ponca, Otoe, and Lakota. The first European to explore the land was the Spanish explorer Francisco de Coronado in 1541 he proceeded to claim the land for Spain. In 1682, French explorer, Robert Cavalier arrived in the area and claimed the land for France. Throughout the years, the land of Nebraksa was fought over by the British, French, and Spanish. In 1803, Nebraska became a territory of the United States of America as a result of the Louisiana Purchase. In 1804, American explorers Lewis and Clark travelled through Nebraksa and reported about the states flat plains and herd of bison that it was home to. In 1819, Fort Atkinson army post was established and in 1823, the first permanent settlement, a small trading post that became Bellevue (the oldest city in Nebraska) was established. In 1854, the territory of Nebraska was created, and people rapidly began to move here as they were also entitled to free land in the area. As people were moving to the area of Nebraska, the Native American Tribes that once inhabited the area, were soon pushed out. Nebraska officially became the 37th State on March 1st, 1867.